Communication, Quality, and Consistency are our #1 goals! Christi’s Green Cleaning uses cleaning products such as Envirox, Bon Ami, Biokleen, and Howard’s Naturals which are non-toxic and environmentally friendly. We are dedicated to making every aspect of our business as eco-friendly as possible, as well as making our customers’ living environment as healthy as possible. Our vacuum cleaners are bagless with filtration systems that trap fine dust particles and allergens, preventing them from recirculating into the air of your home. We use reusable rags instead of paper towels whenever possible. Any paper products that are necessary are made from 100% recycled paper. Our cleaning techs have been through an extensive training program as well as a thorough background check before hiring. Techs are prepared with an extensive work order that addresses the individual needs of a home room by room. Christi has a great team! The woman who cleans our house is incredibly thorough, professional and polite. Having a small child I wanted to be sure not to use any chemicals in cleaning that weren’t necessary. Finding Christi’s Green Cleaning has been a life saver! Great service, great customer care. My wife and I had a baby on the way and knew we needed help with cleaning house. Neither of us had ever had a housekeeping service before. Christi’s has a well organized web form for the estimate, and Christi herself was very responsive with our initial setup questions about process and protocol. When there was a scheduling conflict she worked with us promptly and we got it sorted out no problem. We’ve been happy customers for 10 months now or so, with our same cleaning tech who is awesome. We are SO happy to have a trustworthy, reliable cleaning service that we can afford, so we can have extra time and energy with our new son. When my wife and I were preparing for our first baby, we knew we needed to find a good cleaning service to take some of the stress off of us both before and after our daughter was born. 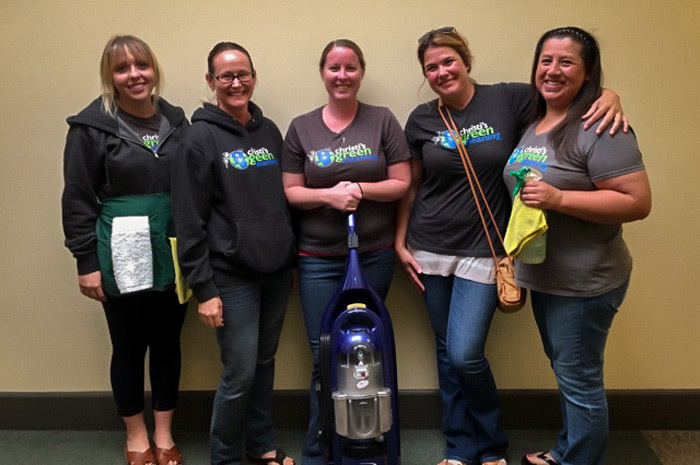 As the environment is also important to both us, we were looking for green services, and Christi’s Green Cleaning has been terrific to us. They are flexible and friendly, quick to respond to messages, and Amber in particular has done excellent work and been very considerate, especially when it comes to our taking care of the baby around her workspace! I think I can say nothing more eloquent than the fact that we recommended Christi’s Green Cleaning to my sister-in-law as well.